Creating this recipe was an interesting research project from its history to the process of making cheese. During my research, I managed to find no less than six different directions to take this recipe in. There were multiple variations, but my goal was to find what I felt to be most in line with what the Abbey at Port du Salut traditionally produced. The recipe below is derived from older recipes, several of which were written between 1900-1936. This is to develop a moist, low acid cheese. This recipe is for 2 gallons of good quality pasteurized milk of about 3.25% butterfat, the result will be 2.25-2.5 lbs of cheese, depending on the final moisture. Note: If using raw milk, use 20-40% less culture and 15-25% less rennet, because raw milk has its own natural culture and the calcium/protein balance is so good that the curd forms with less rennet. You should also skim high fat raw milk back to about 3.25-3.7% butterfat. Begin by heating the milk to 88F (31C). Once the milk is at 88F the culture and b. linens can be added. Allow the milk to ripen for about 30 minutes (less time than many other cheeses) while maintaining the temperature. Next add about 1/2tsp (2.5ml) of single strength liquid rennet. Dilute this in about 30-40ml of cool non-chlorinated water. Stir this in gently for about 1 minute in a bottom to top manner and make sure the milk goes still when done. 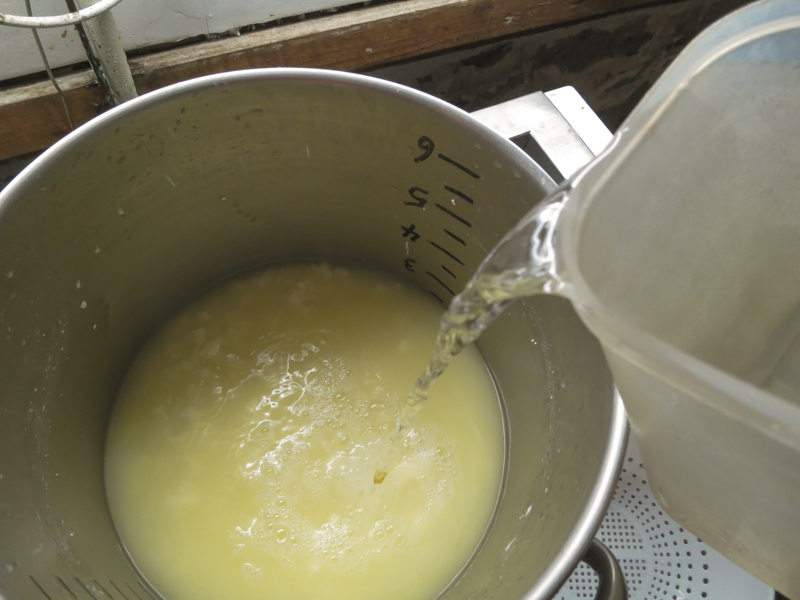 The milk now needs to sit quiet for 30-40 minutes while the culture works and the rennet coagulates the curd. 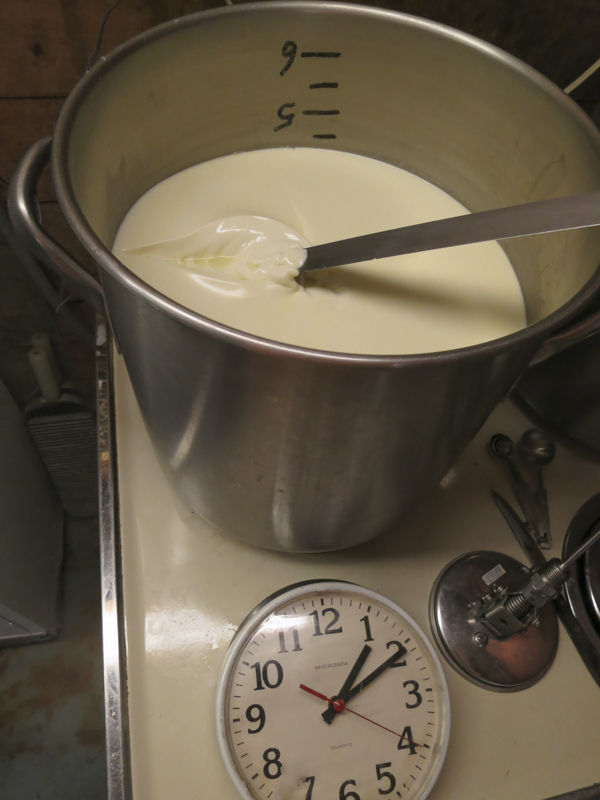 You will notice the milk thickens at about 12 minutes but allow it to go the full time of 30-40 minutes. During the wait for coagulation, make sure your cheese molds and cloth are sanitized. I always keep a pot of warm water (~145F) to sanitize with. This seems to be the most sensible way to sanitize molds, cheese cloth, and other heat stable tools to me. Line your molds with the sanitized cheese cloth. 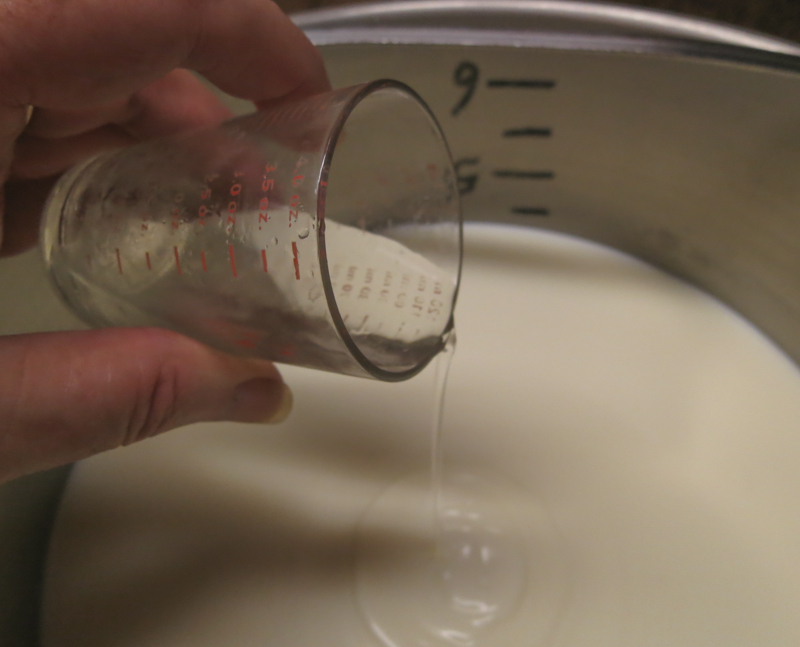 Before the cutting, you are looking for a clean break when you test the curd, by breaking the surface as shown here. The whey rising in the cut should be neither too cloudy (cut too soon) or too clear (cut too late). 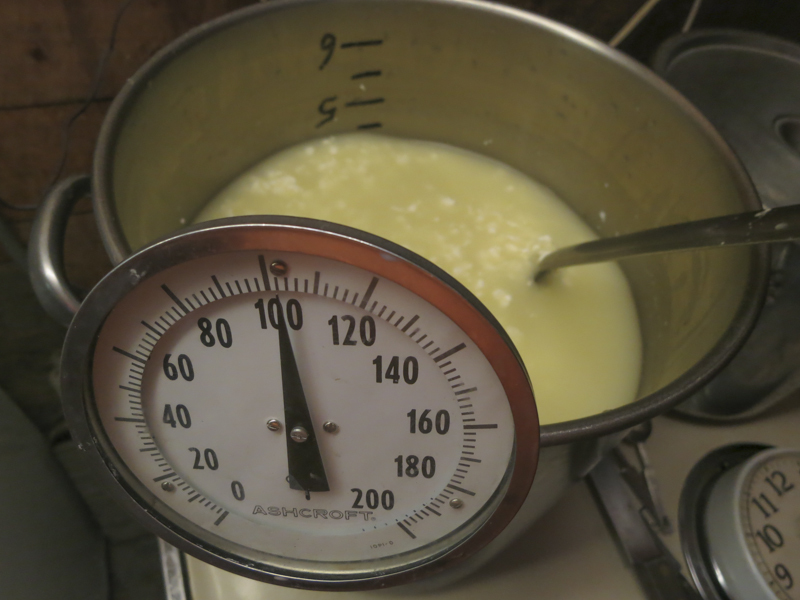 Cut the curds to about 3/8" inch and then allow the whey to rise for about 3-5 minutes. Next stir the curds gently for another 5 minutes. Now it is time to begin drying out the curds. This will be done by increasing the heat slowly to 102F (39C). The heat needs to be increased slowly over a 15 minute period. 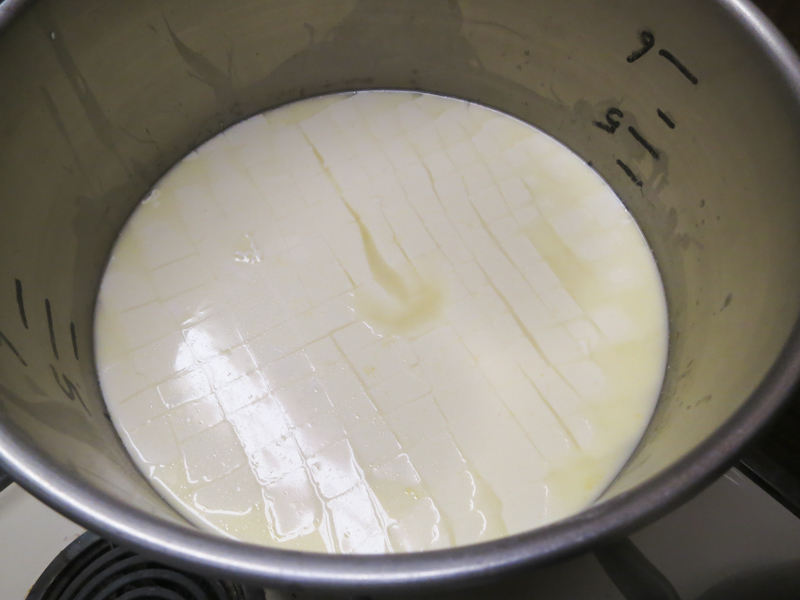 The final curds should be moderately firm and should be examined to make sure that enough moisture has been removed. 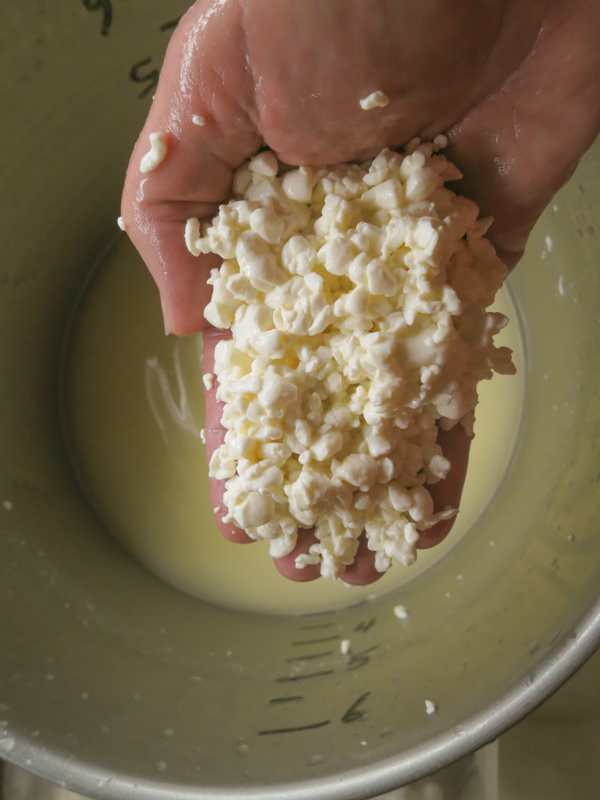 The curds should have a moderate resistance when pressed between the fingers. Whey removal, takes out much of the lactose used as food by bacteria and slow the acid development. Cool water, slows the bacteria activity as it moves back to the original temperature. Salt addition, slows the bacteria and help remove moisture from the curd. 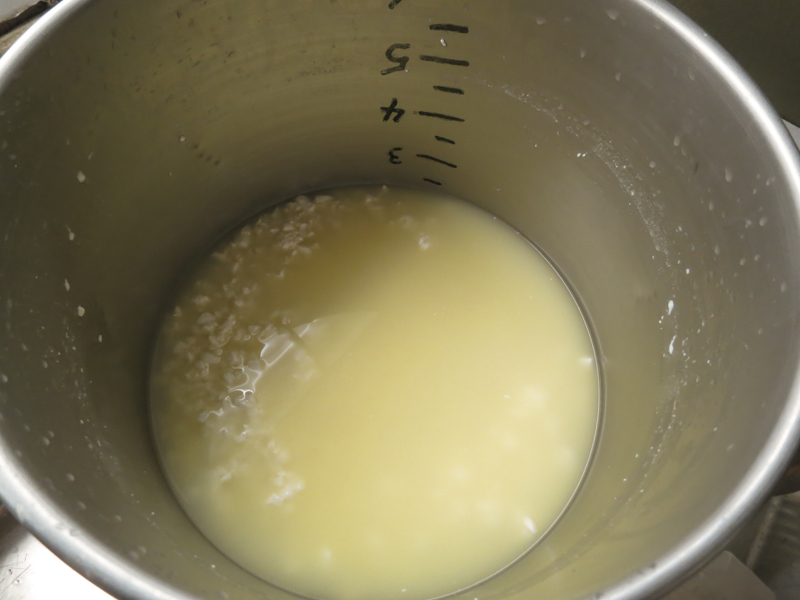 Begin by first preparing the curd wash; this is a light brine made by adding 2 oz. salt to 1/2 gallon of 60F water. 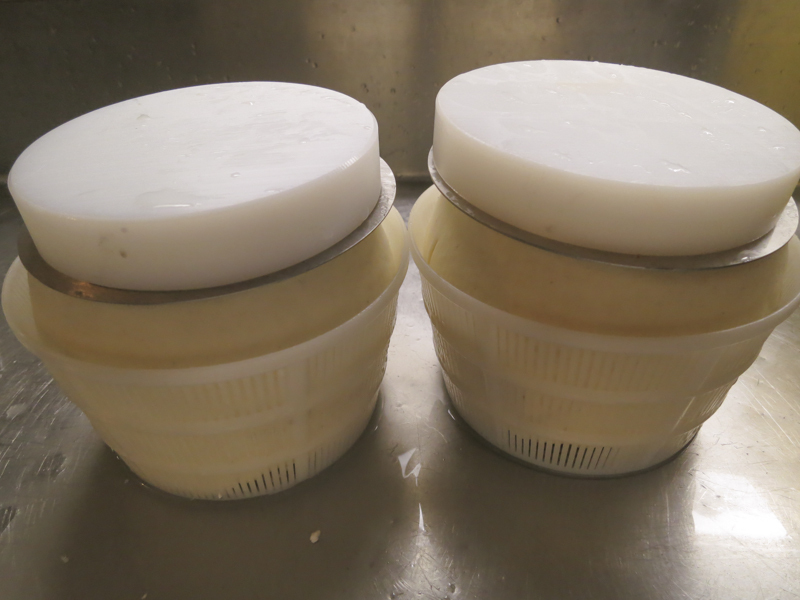 Next remove about 40-50% of the whey, leaving about 1inch of whey above the curd bed. Give the curd mass a quick stir to separate the curds. Then add enough cool brine to bring the temperature back down to 88F (add a bit more cold water if needed). Continue to stir this for the next 20-30 minutes to achieve the proper dryness before molding the cheese. 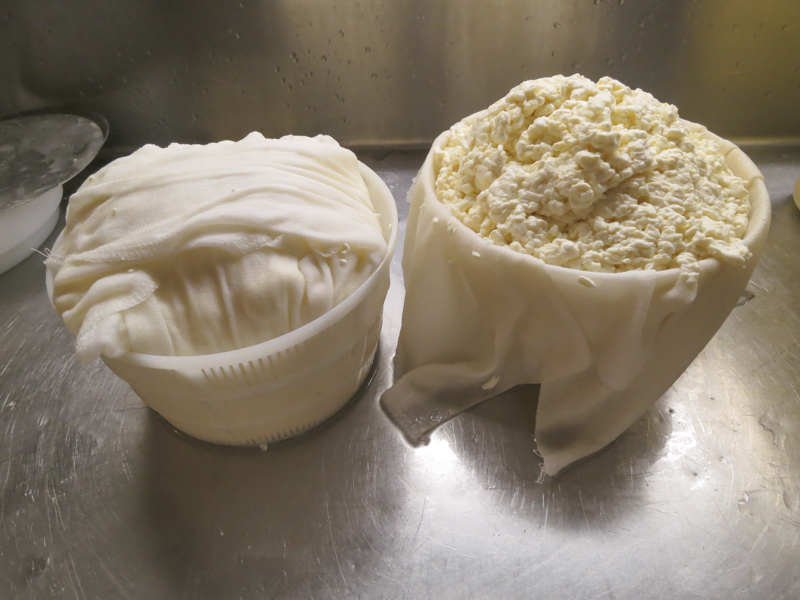 The dry curds can now be transferred to the cloth lined molds that have been sanitized and prepared. Make sure you can accommodate the draining whey that will be released. 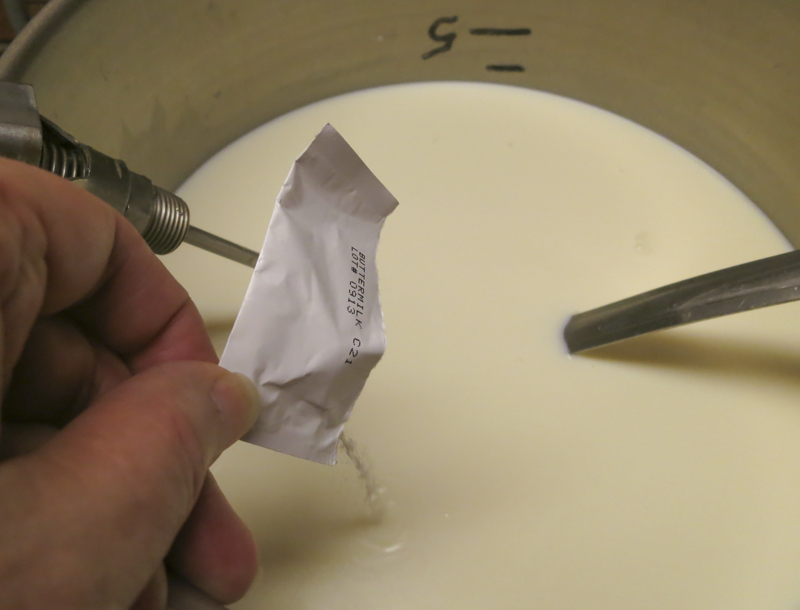 Begin by giving the curd a quick final stir to separate the individual curds. 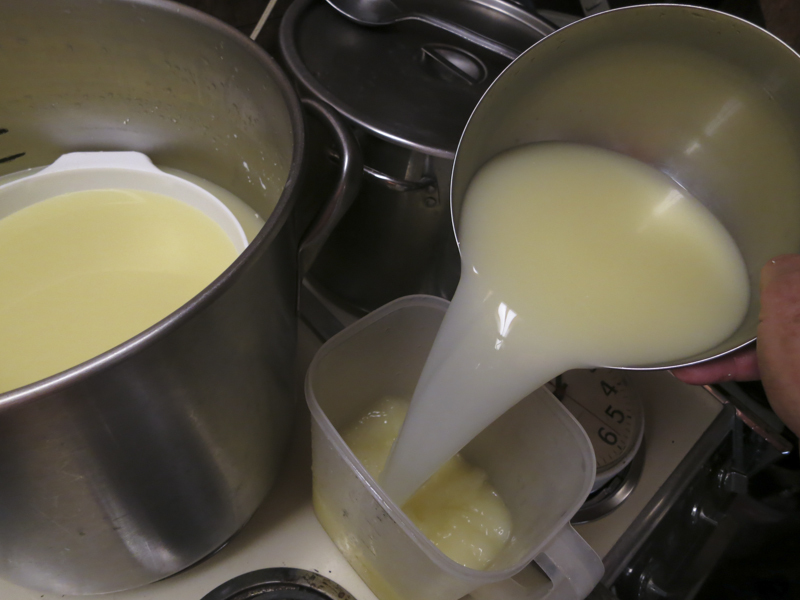 Remove the whey to the curd level and begin transferring the curds with the remaining whey to the molds. 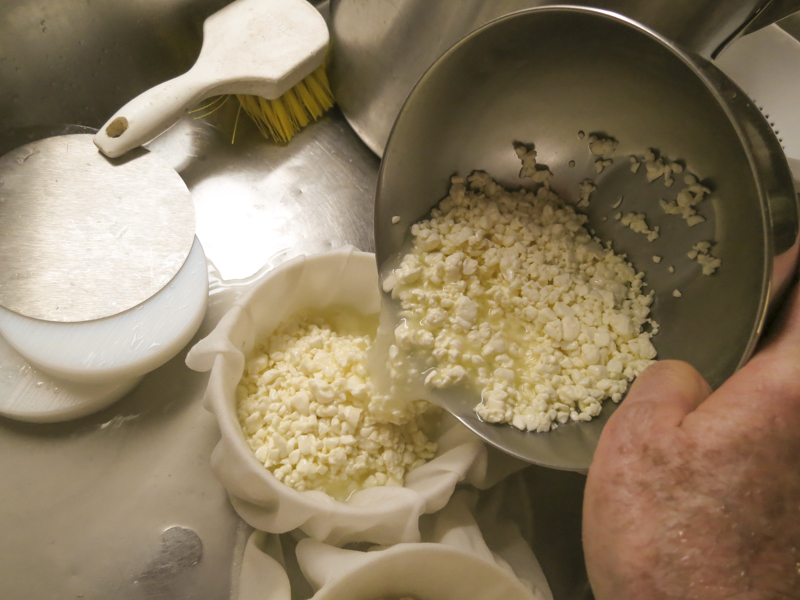 Use firm hand pressure to pack the curds into the mold. 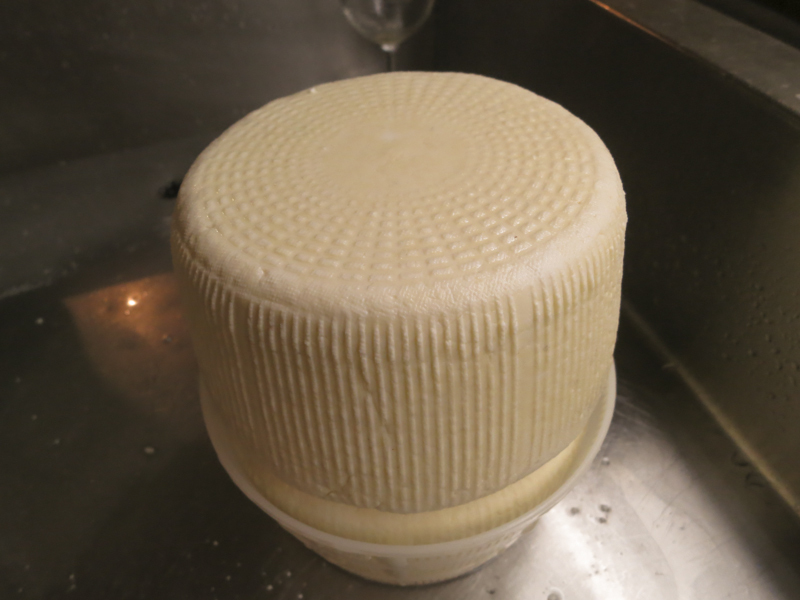 The curd mass will be heaped well over the basket surface initially as shown in the photos here. 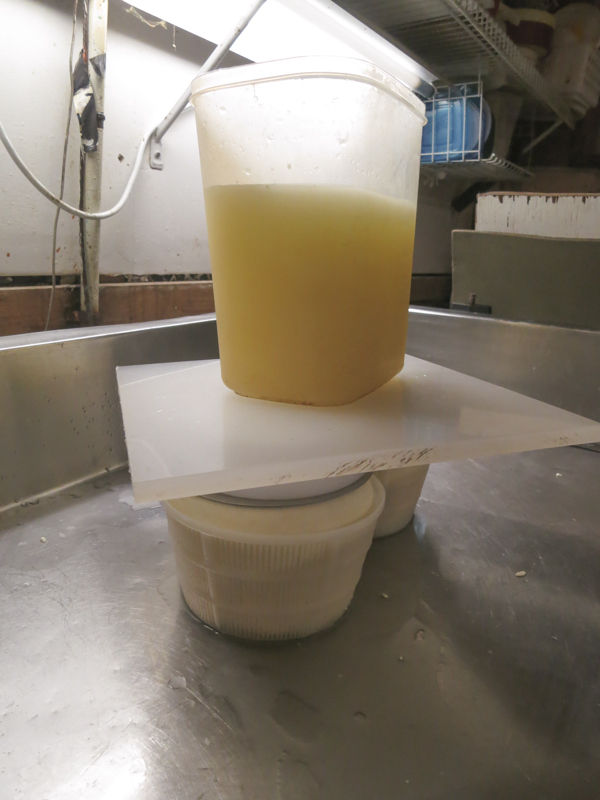 In using the basket molds, the curds should be allowed to drain as the curd is transferred. The Stainless-6inch mold will be a bit easier to work with and will make a wider low form cheese, not quite as high as the basket mold. They both will produce a very nice cheese when ripened. Once the curds are in the basket, fold the cloth as evenly as possible over the curds and place the followers evenly to distribute the weight. 30 minutes at 3-4 lbs. 60 minutes at 3-4 lbs. As you can see very little weight is required for this cheese. 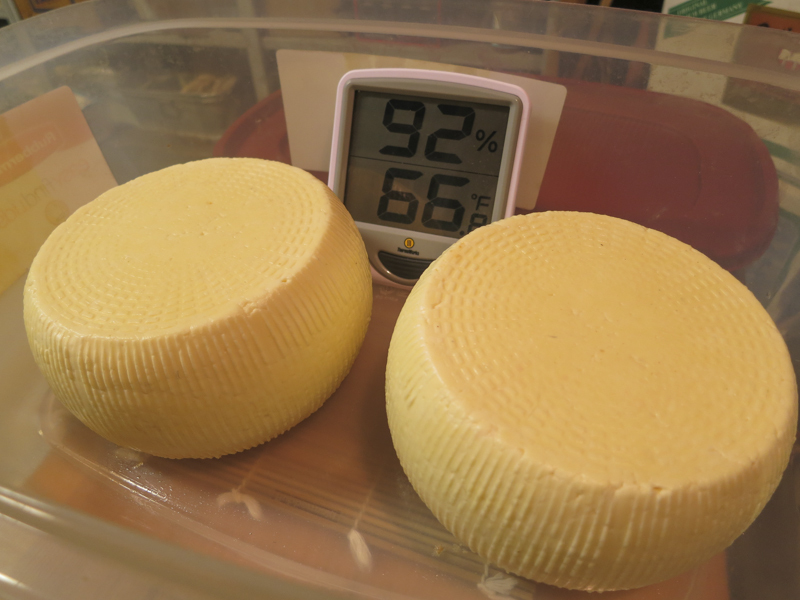 It is essential that the temperature of the cheese during pressing be kept above 75F because the bacteria have not finished converting the remaining lactose. This should be maintained for 16-20 hrs to assure a complete fermentation. When the surface is consolidated (8-10 hrs), the weight can be removed from the cheese, but do maintain the temperature. The cheese now needs to sit in the brine for about 4 hours. The cheese will float above the brine surface, so sprinkle another teaspoon or two of salt on the top surface of the cheese. At the end of the brine bath, wipe the surface and allow the cheese to surface dry for a day before moving to a plastic box with cover to maintain the higher moisture needed for aging this cheese. The surface will begin to soften as the salt migrates into the cheese over the next several days. The cheese needs to be kept at 65-68F and a moisture of 92-96%. 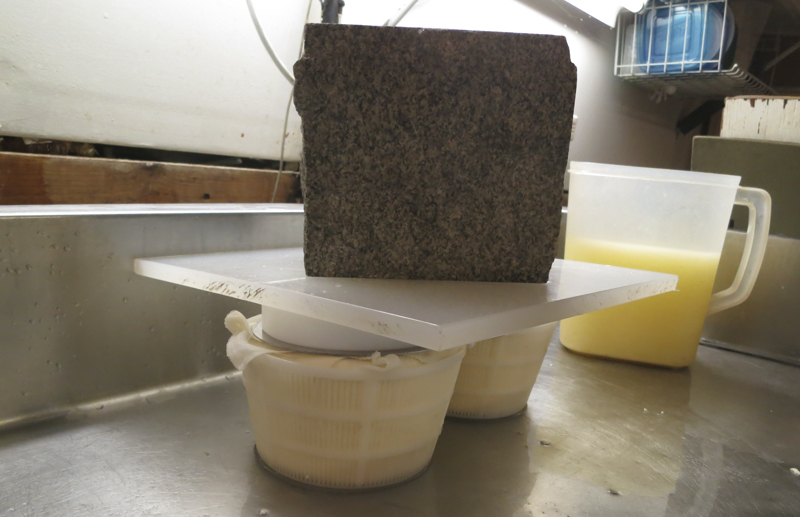 The higher moisture and temperature will encourage the new surface to develop as the cheese ages. Hold cheese 3 days before initial wash by simply flipping it and returning to its covered box (higher moisture). Prepare the first surface wash a day before application with 1 cup cool water +1 tbs. salt+1/16tsp. B.linens. Hold this brine overnight for bacteria to develop before using it to wash the cheese surface. On day 3 following the brine salting, wash the cheese surface with a cloth dipped in the above brine. 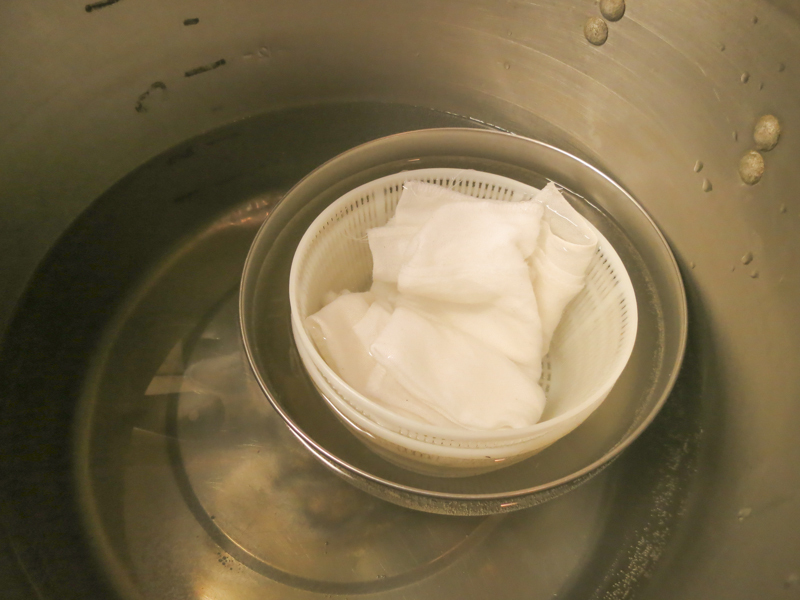 Then on day 7 and 10, prepare the same brine without B.linens and wash the surface again. On day 14 wash all surface mold away (remember, it is just a mild flavor you are after for this cheese). Then hold at 40F maintaining the high moisture for 3-6 weeks depending on your taste. The longer it ages the softer and more complex the flavor becomes.